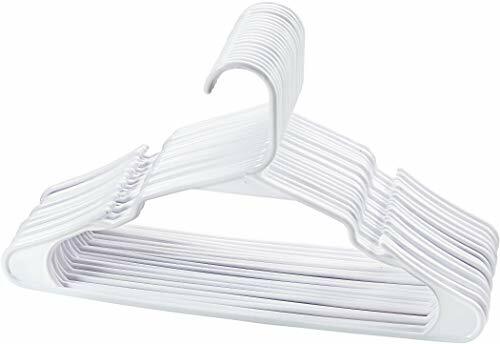 SHARPTY 20-PACK WHITE PLASTIC HANGERS - YOUR CLOSET ORGANIZER! Couldn't find a perfect top that would match with your favorite jeans? If you're tired of seeing your clothes in a messy heap inside your wardrobe, then here's the easiest solution for all your closet organizing needs! Transform your closet from a chaotic mess to a neat, organized space! Our durable plastic hangers will help you give your closets and cabinets a consistent, clean look, so you can access your clothes hassle-free! And their ultra slim, sleek and smart design will maximize space and make your closet look more pleasing to your eyes! NEED MORE REASONS TO CHOOSE US? Made from heavy-duty, durable and strong plastic for years of worry free use. Reinforced edges. Offer better stability and prevent garments from slipping. Smooth, fabric-friendly and seamless design. Keeps your clothes in good condition and will not snag or cause damage to your clothes. Excellent load capacity. Ideal for kids and clothing as well as heavy coats, jackets and winter outerwear. Notched shoulders. Suitable for hanging neckties, scarves, belts, tank tops and other strapped clothing. 20-piece value pack. Doesn't cost a fortune. The most appreciated gift you can choose for all the busy people in your life. Backed by 1-YEAR COMPREHENSIVE WARRANTY! SO WHY WAIT? CLICK "ADD TO CART" BUTTON UP THERE AND MAKE YOU WISE CHOICE TODAY!  ENJOY A MESS-FREE CLOSET. No more messy piles of clothing in your cabinet! SHARPTY PLASTIC HANGERS feature a super slim design to help you maximize your closet space while making it tidy and organized! You can also save time on dressing as you will be able to find your clothes faster and easier!  TOP NOTCH QUALITY. 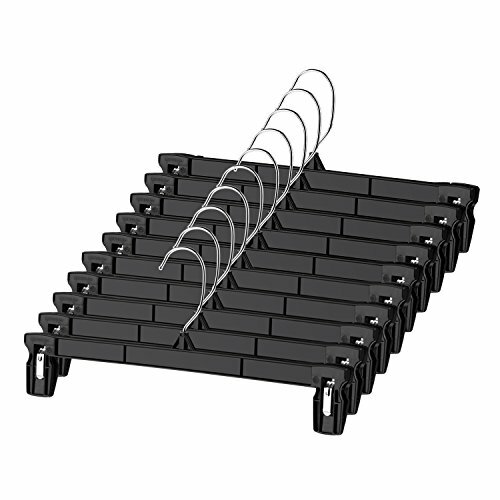 Our sturdy and durable hanger organizers are guaranteed to stand repeated use! 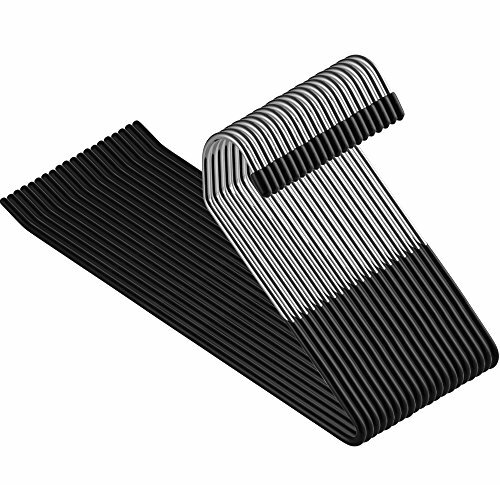 The reinforced plastic edges add stability and provide better support for your standard clothing like shirts, dresses or pants as well as for heavy coats or jackets!  FABRIC FRIENDLY. Our white plastic hangers feature a clean and smooth finish offering you the best value organization tool for your closets and cabinets. There are no rough or sharp edges like other hangers, so you never have to worry about any damages, unwanted creases or marks on your clothes.  BUILT-IN SHOULDER GROOVES. Our versatile laundry hangers are suitable for kids and adult clothing, but can also be used for other accessories! Designed with notched shoulders, these nonslip hangers are great for hanging ties, belts, shawls, thin strap shirts, tanks and women undergarments such as bras, nightgowns, and camisoles.  SWEET SATISFACTION WITH 1 YEAR COMPREHENSIVE WARRANTY. We literally got you covered in any situation, but for any reason, if you are not completely satisfied, simply let us know and we do everything to make you 100% satisfied with your purchase. Zober non-slip pants hangers pack of 20 feature a rubber coating on the pant bar that keeps clothing neat and in place. The coating on the trousers hangers also aids in keeping clothes from wrinkling and creasing. These incredible jean hangers feature an open end for easily hanging skirts, pants, towels, linens, scarves, and accessories! 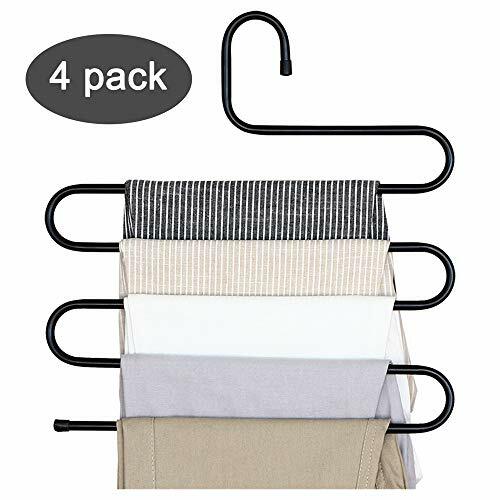 The dress pants hangers hook fits standard closet rods; perfect for any size closet, including dorm rooms! Our hangers for pants are constructed of strong and durable chrome plated metal that effectively prevents rust and resists breakage. These sturdy slack hangers can accommodate multiple garments while resisting deformation. Our one of a kind opened hangers have rubber tips fitted over exposed edges and the tip of the hook to ensure no damaging snags on clothing or injuries. The open ended hangers maximize storage space and aid in decluttering closets. The hangers for jeans are absolutely ideal in keeping closets organized, giving it a sophisticated and stylish look. Dimensions: 14 wide, 6 from top of hook to bottom of hanger. still looking for ways to save closet space? Wanna these Pants Hangers are excellent? Wanna hang 5 pairs of jeans/dress/sweatpants/ties at same time? Our pants hangers can solve all your question, use them and only take up the space of one hanger!!! 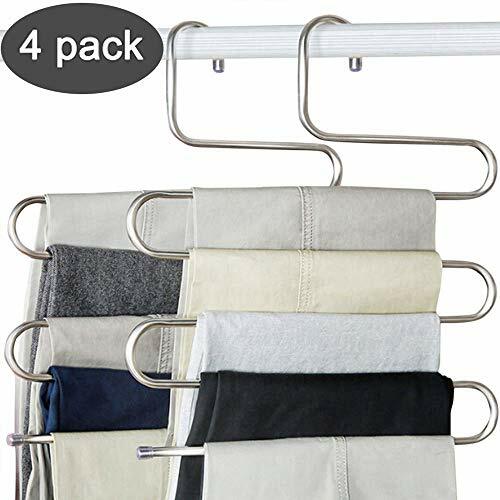 SPECIFICATION: * Name: Pants Hangers * Design: 5-layers * Material: Stainless Steel * Color: Classic Silver * Weight: 220 g PACKAGE INCLUDES: 4 * Pants Hangers 10* Stainless Steel Clips FEATURES: * Made of Premium Stainless Steel. Durable and not easy to be out of shape. * Perfect for apartment, house, dorms, bathroom etc. * Compatible for pants/ clothes/ towel/ sweatpants/ scarf/ trousers/ slacks/ ties etc. * Unique Design, convenient you to hang and remove slacks quickly and efficiently. Saves lots of space in your closet. * Non-slip caps on the ends which look and feel very secure and should not fall off. * Perfect for Family Economical Storage Indoor Wardrobe Hanging. Unique Design Any Clothes is Suitable -- Smooth surface with transparency rubber coating at the end of the hanger to avoid the clothes fall down from the hanger. Compatible with all kinds of clothes. Perfect for hang your jeans, pants, trousers, ties, scarf, etc. That make it compact and organized. Keep pants neat and organized on the poles and tidy. You will love being able to hang more pants and save space. LARGE NON-SLIP CLIPS Robust pinch grip clips at the two ends, are larger than most pants hangers. They are easy to open, so your hands will feel no pain. Non-Slip clips can hold 20 lbs weight, and prevent your clothes and hands from deep indentations. 360 ROTATABLE HOOK 360 degree flexible swivel hook makes hanging and accessing clothes easy! Skirt hanger with durable stainless steel hook, which is finished in chrome for rust-resistant shine! 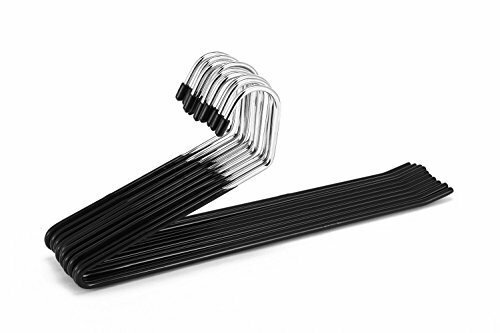 THICK SHAPE, STURY MATERIAL These black hangers are very durable with a thicker design and premium quality plastic. They are splinter-free, break-resistant, sturdy enough to withstand any heavy jeans, large trousers or wet clothes, meet your daily use and look so smart in your tidy closet. DECENT SPACE-SAVING DESIGN Measuring 12 in length, 6.5 in height, this hanger has a space-saving design which helps perfectly keep your clothes organized. Big clips can even hold more than 1 pant or skirt. Buy it to keep your closet neat, your pants and skirts will be wrinkle-free. 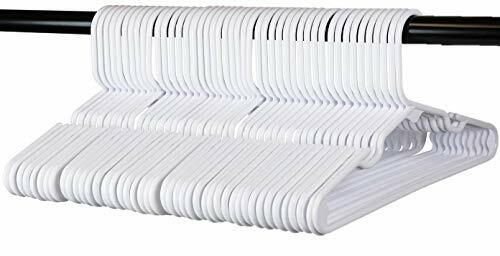 30PCS in ONE, SUFFICIENT FOR FAMILY The bulk pack of 30 pant hangers makes it ideal for family use, enough to create a uniform look in your bedroom closet. Families will feel it warm, elegant, and economical. This would be a great product chosen by you today! Wood skirt hangers organize and add a chic touch to closets; these wooden clothes hangers are essential for hanging skirts, pants, jeans, shorts, Slacks, and more! 2 solid wood bars lined with soft felt for gentle yet secure non-slip full-width grip; wooden closet hangers coated with clear lacquer for splinter-free finish that's safe for all clothing materials. Clip mechanism unlocks and releases bars by pulling hook back, allowing them to open wide for easy placement of clothing; natural hangers lock when hook is pulled forward. 360 degree swivel hook makes hanging and accessing clothes easy! Trouser hangers durable stainless steel hook is finished in chrome for rust-resistant shine! 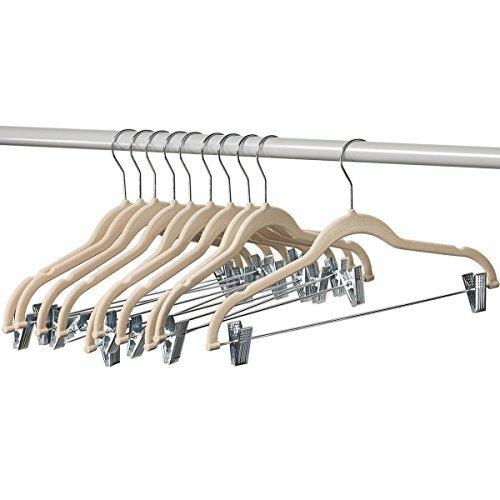 Space saving hangers slim body takes up less surface area for maximum use of closet space. 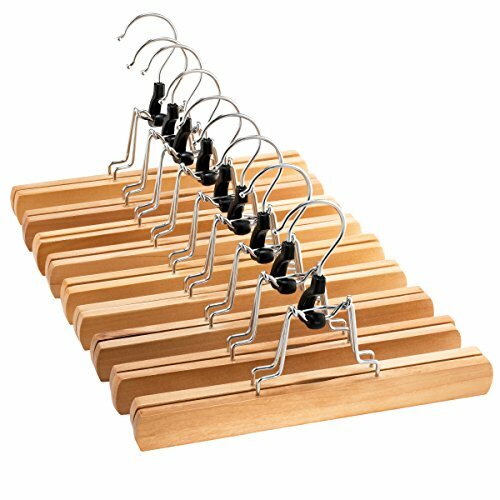 Wooden pant hangers dimensions 9 L x 6 H ( 10 pack ). 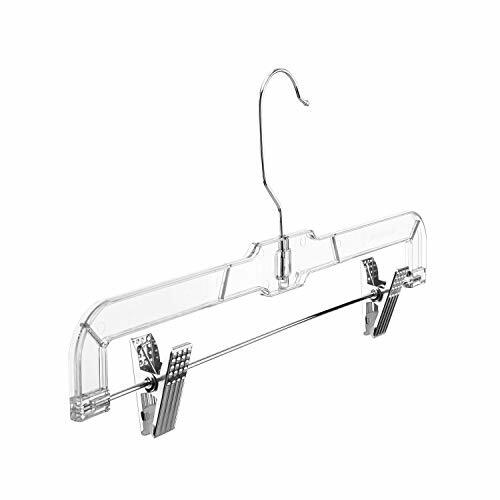 DOIOWN S-type Stainless Steel hanger is specific design to effective save your wardrobe space. Each hanger can be used for hanging 5 pants and blouse, or it can also for hangering ties, belt and scarf. These S-type hangers will keep your wardrobe clean and orderly. These S-type hangers is made of prime stainless steel which is durable and rust resistance. It can be used for a long time. Sturdy construction & won't be easy to out of shape. The hanger has high hardness and intensity that make it won't be easy to out of shape. It can be used for hanging 5 pants and other clothes at the same time. Space saver & Keep your wardrobe clean and orderly. This Multi-purpose S-type hanger will save more space for your wardrobe which is you could storage more item in your wardrobe. Besides, it can also keep your wardrobe more clean and orderly. Smooth surface and scratch resistance. The hangers have smooth surface that it will protect your clothes and pants from scratching and creases. We offer a 30 days money back guarantee. If you have any questions, please feel free to contact us, our customer service will be more than happy to assit you. Material -- DOIOWN S-type made of stainless steel which is durable and won't get rust. Advantages -- Durable and Rust Resistance. It can be used for a long time. & Sturdy construction and won't easy to be out of shape; & Save space and keep your wardrobe clean and tidy; & Smooth surface and scratch resistance. Protect your pants and clothes from scratching and creases. Shop With Confidence -- We offer a 30 days money back guarantee. If you have any questions, please feel free to reach us out. Our customer service will be more than happy to assit you. * Weight: 220 g PACKAGE INCLUDES: 4 * Pants Hangers FEATURES: * Made of Premium Stainless Steel. Durable and not easy to be out of shape. * Perfect for apartment, house, dorms, bathroom etc. * Compatible for pants/ clothes/ towel/ sweatpants/ scarf/ trousers/ slacks/ ties etc. * Unique Design, convenient you to hang and remove slacks quickly and efficiently. Saves lots of space in your closet. * Non-slip caps on the ends which look and feel very secure and should not fall off. * Perfect for Family Economical Storage Indoor Wardrobe Hanging. 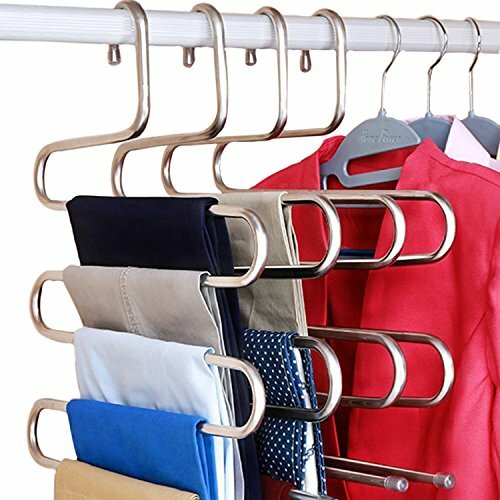 Yours High Quality Hanger - Made of Stainless Steel which makes the pants hangers good quality with high hardness, durable and strong bearing force that can be used for a long time, the pants rack will never rust, worry free. Unique Design - Non-slip caps on the ends which look and feel very secure and should not fall off. These hangers would make a great pants, scarf and tie holder as well. Any Clothes is Suitable - Compatible with all kinds of clothes. Perfect for hang your jeans, pants, trousers, ties, scarf, etc. That make it compact and organized. Keep pants neat and organized on the poles and tidy. You will love being able to hang more pants and save space. Easy to Use- Each hanger can be hanged for 5 trousers/ ties at same time. Save the space in your closet that offer you more space to storage some other things. Don't worry about the distortion of the pants rack, always durable and keep a good shape as its premium quality. 100% SATISFACTION GUARANTEE - If you have any question about the product you received, please contact us without hesitation. We would try our best to help you and improve your purchasing experiences. Backed by a 100% No-Hassle Money Back Guarantee. we can hang our scarves, belts, tie ,necklaces and etc on these. The sure grip does great at keeping clothes, scarves and belts in place and secure without them sliding off. These take up very little space in the closet When we need clothes easily pull them off the hanger. In home ,the hangers hang well in the closet, the shower bar, and hooks on the back of the doors or door knobs and so on. These are high quality metal hangers and worth every penny. - Without the back design, Pants are very easy to remove. - The maximum weight capacity of hanger is 10kg that doesn't bend even if put multiple items on the same hanger. - The rubber has some stickiness to it and the clothing stays put! - Design of bending and anti stripping. 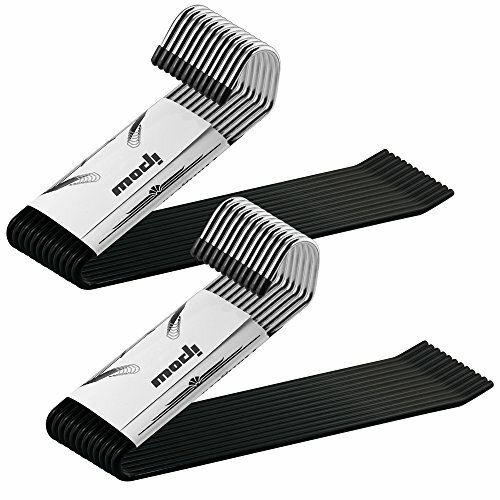 - Optimize materal extraction process,the surface smooth and delicate,no sharp edges. - Heavy duty, sturdy, conveneient design. With 100% Satisfaction, If you have any question , pls contact us immediately and we will be happy to exchange it or refund you. Click the "Add to Cart" NOW! HEAVY DUTY & SUPER STRONGER: Metal diameter: 5MM other ordinary pants hanger: 3MM), Long 13.2 inch.Fit closet rod Diameter within 1.6 inch.The maximum weight capacity of hanger is 10kg so doesn't bend even if put multiple items on the same hanger. DEFINITELY ARE SPACE-SAVING: Hanger don't take much space and maximize your storage room in your closet. OPTIMIZE MATERAL EXTRACTON PROCESS: The surface smooth and delicat, no sharp edges, protect your clothes and your hands. REMOVE QUICKER & EASIER: Without the back design, these hangars make it easy to get the pants out of the closet in a hurry. without even having to remove the hangers. Hanger were made from the same piece of metal instead of being welded together, without having to worry about them falling apart.